Stylish new tactical weapons system from RICO is rugged and a high performer. As seen used by US military personel. Constructed with a high quality polymer body and aluminum skeletal frame. Super strong 3mm poly-carbonate lens means that the flashlight lens is indestructable with any airsoft gun. Super powerful and focused beam delivers a stunning 250 lumen output, while 2 integrated LED lamps provide stealth illumination! MSRP is USD275 but our price is USD169! 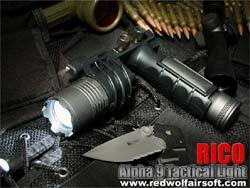 The Alpha 9's ruggedness and performance exceeds that of many real-steel lighting systems.